Added to the heavy slate of period films in 2014 will be a new Joseon Dynasty era drama staring HAN Suk-kyu and KO Soo. Sanguiwon(literal translation) will be the sophomore feature of How to Use Guys with Secret Tips director LEE Won-suk. 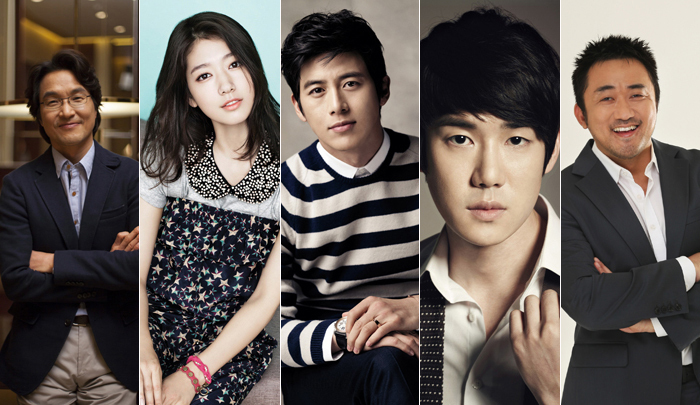 Also starring will be PARK Shin-hye, YOO Yeon-seok and MA Dong-seok. HAN Suk-kyu will play Dol-seok, the master artisan of the Sanguiwon, the people responsible for making robes for the royal family. Dol-seok follows strict procedures while Kong-jin (KO Soo), a talented new designer with natural instinct, is brought to the palace by nobleman Pan-soo (MA Dong-seok). The clothes designed by Dol-seok and Kong-jin eventually plunge the King (YOO Yeon-seok) and Queen (PARK Shin-hye) into a serious situation. Director LEE Woo-suk made his debut earlier this year with the colorful romcom How to Use Guys with Secret Tips, which was invited to numerous overseas events, including the Shanghai, Hawaii and Fantasia International Film Festivals. It also won the Audience Award (Golden Mulberry) at the Udine Far East Film Festival. HAN Suk-yu starred in My Paparotti and the hit spy thriller RYOO Seung-wan’s The Berlin File this year while KO Soo is currently in theaters alongside JEON Do-yeon in PANG Eun-jin’s Way Back Home. The costume drama, which will be produced by Bidangil Pictures (The Chaser , A Werewolf Boy), will go before cameras in February 2014.